ISLAMABAD: The provinces will be made part of ongoing dialogues with International Monetary Fund (IMF) regarding fiscal targets over medium term. This was agreed at the inaugural meeting of the reconstituted 9th National Finance Commission (NFC) was held here on Wednesday. 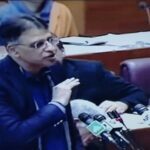 Finance Minister Asad Umar welcomed all the participants to the meeting and said NFC has been tasked under the Constitution with amicable distribution of financial resources among the federation and the provinces, and as such its effective role had an important bearing on overall national cohesion. Federal Secretary Finance briefly recounted the history of NFC awards and shared with the participants details on fiscal position of the federal government. He apprised the meeting about federal fiscal operations and net revenues of federal and provincial governments. Provincial Ministers/Secretaries Finance gave the meeting update on their fiscal position and also in the process dilated on issues faced by them in different spheres due to resource constraints. Secretary Finance Punjab called for improved coordination between federal and provincial authorities for timely data sharing. Member Sindh pointed out less transfers made under the heads “Straight Transfers” and proposed that data on this account may be shared with Provinces. The participants laid emphasis on smooth vertical and horizontal transfer of funds. The participants also emphasized on the need to end regional disparities. The chairman of Federal Board of Revenue (FBR) on the occasion briefed the meeting on revenue generation/tax collection in the current financial year. (6) Integration/ merger of FATA in Khyber Pakhtunkhwa to be coordinated by Khyber Pakhtunkhwa. It was decided that the next NFC meeting will be convened after six weeks at Lahore. NFC Sectt. at the Ministry of Finance will be further strengthened for better coordination amongst the sub groups. Chief Minister Sindh, Murad Ali Shah, Finance Minister Punjab, Makhdoom Hashim Jawan Bakht, Finance Minister Khyber Pakhtunkhwa, Taimur Saleem Khan Jhagra, Federal Secretary Finance, Provincial members, Provincial Secretaries Finance and senior officials of the Ministry of Finance attended the meeting.